The other day Nate walked in with the mail and instantly asked me who I knew that lived in Israel. I stood there with a blank look in my face trying to figure out what exactly he was talking about. He handed me an envelope and said it had funny stamps on it. As I looked it over, I quickly realized it was from an Etsy seller whom I had purchased two necklaces from some time ago. This necklace is one that I wear fairly frequently. 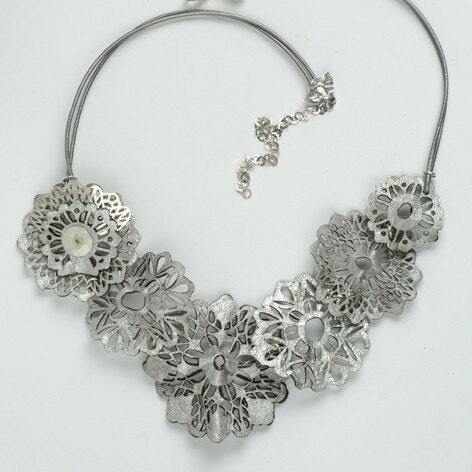 I love the soft lace look of it, with the strong look of the silver. This is a great necklace for a basic top (I find I wear it with a tank top a lot). I love the mixing of different materials. Anyway, back to the envelope. As I opened it I realized that there was something inside. Something more than just a card. Hooked onto the card was a little bobby pin, topped with one of her leather creations. It's such a simple gesture, yet at the same time it reminded me about how much I love her products. I would have been perfectly happy with a card, but she went a step further to show her gratitude. Sometimes it's just the little things in life that bring out joy.